Preston Boomer doing his thing at SLV. He was a science teacher at SLV for as long as anyone can remember; he changed lives, inspiring thousands to succeed in the world. His students have gone on to direct movies and run governments; he is the most interesting man in the world. Preston Q. Boomer, affectionately called “The Boom”, was one of the most iconic figures in Santa Cruz county. He retired last year after enduring ankle surgery. Now, everyone is wondering: Who will take up Boom’s mantle? Martin Schafer, former science teacher at Scotts Valley High School, has stepped up to the plate. With youthful exuberance, a turtle named Squirt, and a fondness for colorful shirts, Martin brings to mind a younger Boomer in the minds of many. When told of this, Mr. Schafer laughs and replies “I’m honored. Honored to be allowed to follow in his footsteps”. And he should be: Mr. Schafer will have a lot to live up to. Preston Q Boomer taught at SLV for 56 years, since the tender age of 25. He’s seen it all; the hippies, the hipsters, and the rise of the cell phone. He’s instructed more than eight thousand students in his time, and built an underground system of tunnels to boot. Class with Boom was controlled chaos, which many students remember fondly. “On back to school night, Boom set off the ‘Bam-Can’. My mom shrieked so loud, it was funny,” recalls McKenna Maness. When Boom spoke, others listened, unless they wanted to get their chairs wired to a shocking Tesla Coil. 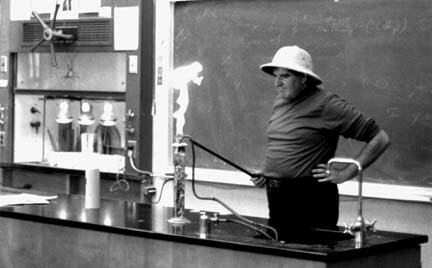 Even in his twilight years, Boom’s students paid close attention, reluctant to miss the latest explosion or wacky gadget. “Physics is Phun”, as the Boom was fond of saying. Though Boomer’s classes were entertaining before, Mr. Schafer has taken this opportunity to upgrade the Boom’s curriculum– both of his own volition and in answer to the school’s requests. “Everything is going to change, because we’re moving to next generation science standards. Common Core includes more writing in the curriculum. I do, however, want to include Boom’s demos. He knew how to get kids engaged”, says Martin. One such change in the classroom is the use of tablet devices, which allows Mr. Schafer to display equations on the wall with ease. Another change involves the lab and homework system; no longer will students be required to print out everything by themselves. And what does the Boom himself think of his replacement? “I have met Mr. Marty”, says Boomer, “His kids were attending our summer music camp at Boomeria, so I got to ‘corrupt’ him for hours.” Uh-oh….wonder what ‘corrupt’ could mean. Is there a dark side to Physics? Perhaps the Boom will tell us when he returns to SLV sometime in the future. Though he is now retired from teaching, the Boom might occasionally visit SLV for a guest lecture or two, just to keep us whippersnappers in line. Let that be a warning to you loafers! When he’s not entertaining students part time, Boom will be at his country kingdom of Boomeria in Bonny Doon, waiting to repel attackers and welcome former students. His castle gates are open to anyone who isn’t afraid of getting a little wet and is true of heart. Additionally, Boomer hosts a number of events at Boomeria, from a Celtic Music festival to an organ-playing party. Expect to be challenged by a hearty “Who goes there?” if the gates are closed, though. Goodbye Boomer. We’ll miss you and your wacky classes. You made the lives of SLV students interesting. And as for all the teachers who wish to follow in his footsteps, remember these words of wisdom. “Keep enjoying the students, have maximum fun teaching. Join a Focus Group, learn the educational jargon, and Front-Load it for display.” And don’t forget to have phun!